This time I want to talk about the care and maintenance of tow rope. In particular DYNEEMA (HMPE – High Modulus PolyEthylene). Your tow rope system is, contrary to what an engineer or naval architect may tell you, the most important piece of kit on your tug. Without it, all you can do is look pretty and push things! Today the most common type of rope in use in the towline system is Dyneema. This can be used in conjunction with other fibre types such as Polyester, Polypropylene and even Nylon. All these types of rope have varying degrees of elasticity and in general, will be used as main lines or stretchers. The wire is still used as main lines in some systems as well. We will deal with these types of ropes in another edition of Small Angles. The Dyneema will in most cases be the working end of your tow rope system and either as a Grommet or a pendant. In some cases, you may have simply one rope which will be only Dyneema but this is not common. With the advancement of experience by rope manufacturers, as provided by tug operators, special Dyneema chafe protection sleeves have been developed to provide additional protection to the Pendants and Grommets. These are fitted in high-risk areas of the tow rope such as the eyes and the working end of the rope. (Particularly the area from the eye back towards the Tug) Please note that these Chafe Protection Sleeves are non-load bearing and can, if necessary, be repositioned or reused in a lot of cases. The importance of this additional Chafe protection cannot be stressed highly enough. As tug masters and your crew often can not see the condition of the fittings that your tow ropes are going to encounter when you send your lines up. Where a vessel has been serviced by a tug using wire, or her own berthing lines are wire, if the fittings are not well maintained or seldom used they will grow rope killing rust and without this additional protection damage to the tow rope is inevitable. 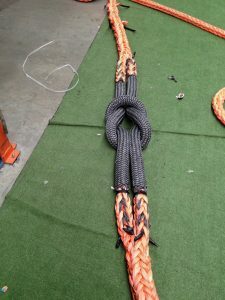 As stated earlier, the tow rope is vital to the effectiveness of your tug and as such, it is very important for the crew to regularly inspect the ropes to ensure that the integrity of the material is not adversely compromised. As a general guideline, every time the ropes are deployed and recovered a general inspection should be undertaken, looking for Abrasive damage, twisting of the rope, signs of overheating, glazing, discolouration, pulled or separated strands or inconsistent diameter. If a shock load is experienced during a tow it is vital that a thorough inspection is undertaken as soon as possible and before another job is undertaken. Particular attention should be paid to those areas of the tow rope that have been in contact with Ships/Tug fittings as these are areas of high risk for potential damage. Regular more formal inspections should be undertaken as prescribed by your internal planned maintenance schedules or as required. To assist with these inspections most rope manufacturers will provide guidelines if they are not already onboard ask for them. Today the internet is a marvellous resource for information, the trick is to ask the correct question! To assist you I have found a couple of references. A relevant paper I presented to the 19th International Tug & Salvage Convention in 2006.